My daughter has been out on her mission for The Church of Jesus Christ of Latter-day Saints for eight months now. 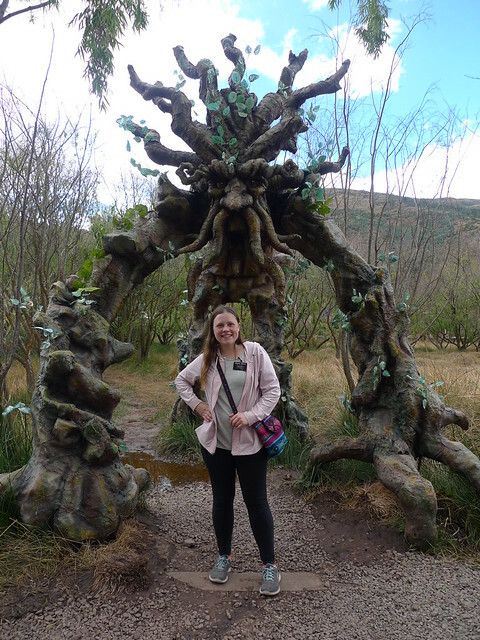 She is the third missionary in our family (our immediate family), following in the footsteps of her father who served his mission in Santiago, Chile, and her big brother, Zach, who served his mission in Calgary, Canada. In our church, elders serve for two years and sisters for eighteen months. 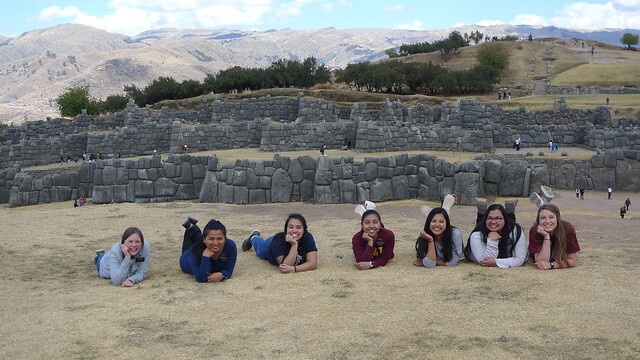 This was taken at Sacsayhuaman. Aren’t these just the cutest group of sister missionaries? Marissa is on the far left. Most of these photos were taken on her weekly p-days (personal days). 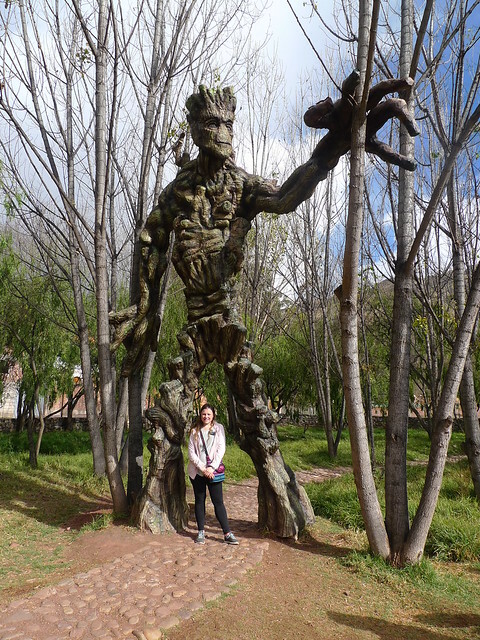 Since Cusco is full of amazing history and tourist sites, she has been able to experience some of these things as part of her mission. On the other six days of the week she teaches the gospel of Jesus Christ and gives service. 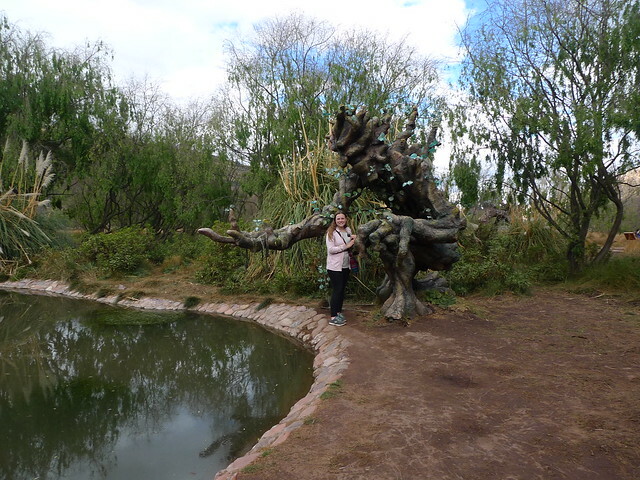 In July she got to visit the coolest park which I didn’t even know existed in Cusco. 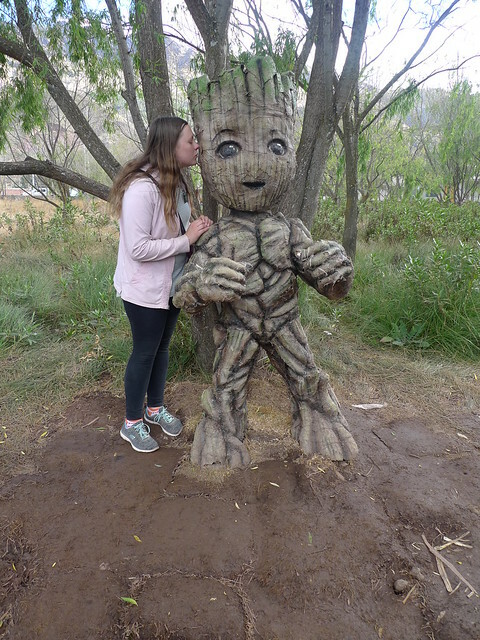 She “met” Groot and Baby Groot! Can you tell what Marissa is holding? This was taken at a baptism. 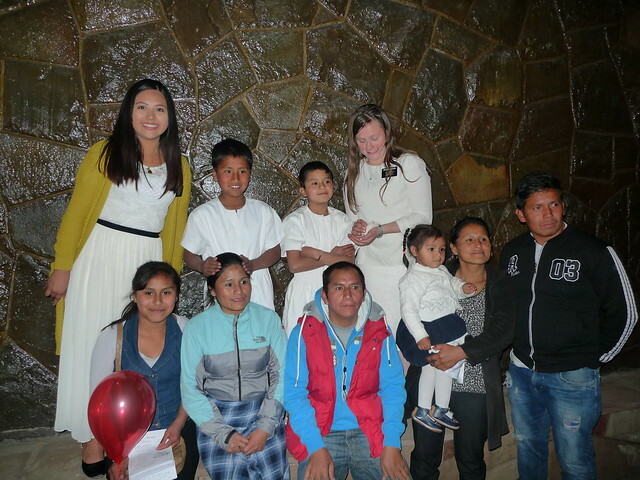 Marissa and her companion taught the two boys who are dressed in white. In our church, children may be baptized at the age of eight and older. Eight years old is considered the age of accountability. If you’d like to learn more about our beliefs about baptism, especially concerning babies and children, please click here. Our beliefs come directly from scripture and revelation. 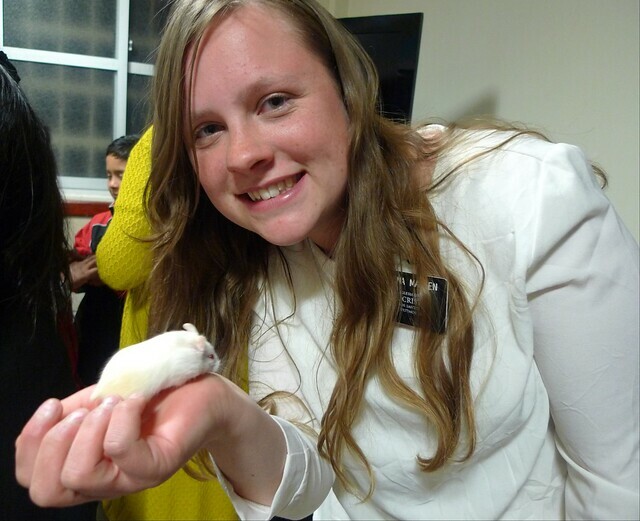 Marissa loves all of God’s creatures and plans to pursue a career with animals after her mission. Her nickname is “Mouse” because of her love for cheese and Minnie Mouse. Marissa painted this picture for each boy. 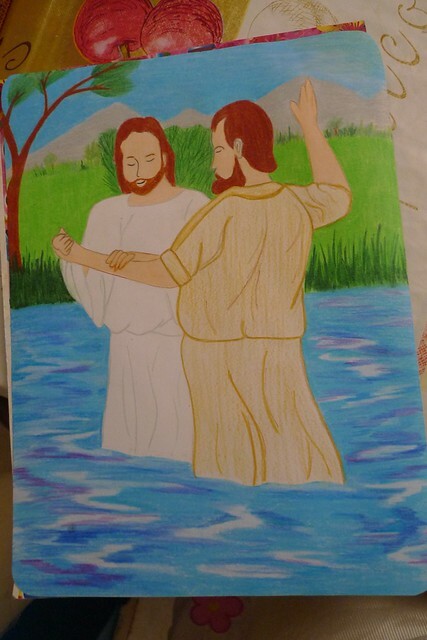 She loves to paint so this was a fun way she could use one of her talents on her mission. 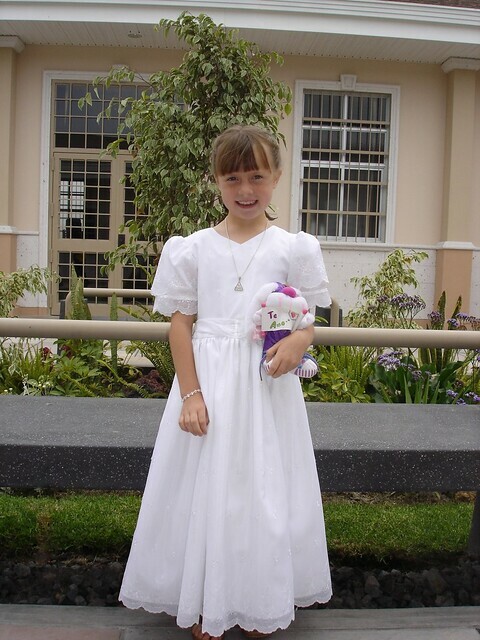 Marissa was actually baptized in Peru because we were living in Arequipa as a family when she turned eight-years old. 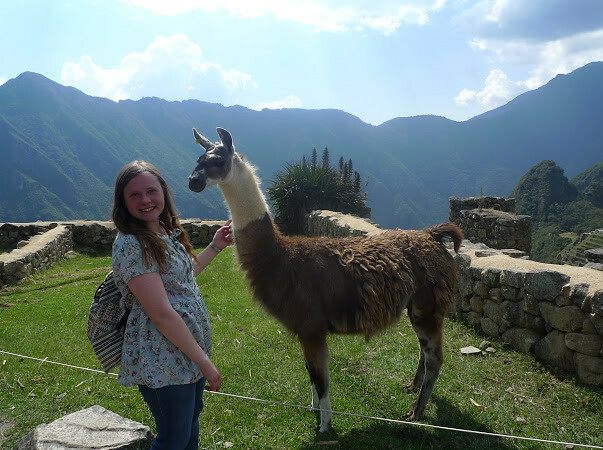 Just a few weeks ago Marissa got to visit Machu Picchu for her third time. 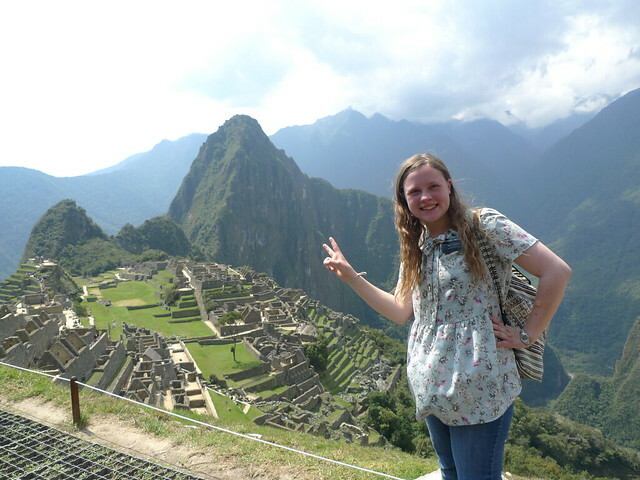 Missionaries get to visit once per mission, but Marissa saw Machu Picchu when she was eight and again when she was seventeen. Marissa has recently been transferred to Juliaca. She was very excited because she recognized Juliaca from our time spent there when she was a young girl. Wishing my readers and blogging friends a Happy Easter. My missionary has been out for 8 weeks now. 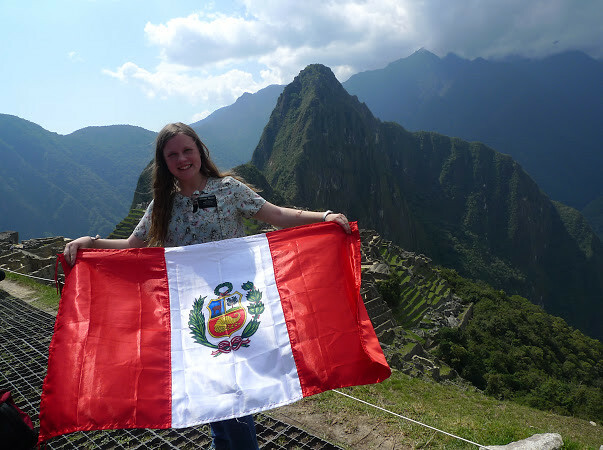 She spent the first 6 weeks in the MTC (missionary training center) in Lima, Peru. 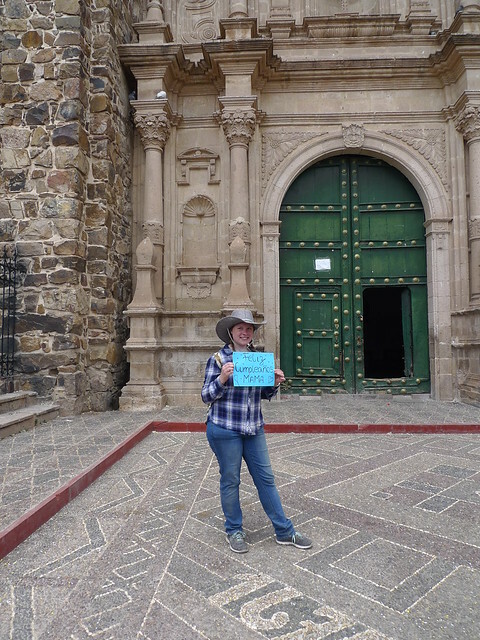 Now, she’s in her first area of her mission, in Cusco, Peru. Doesn’t she look happy? She reports to us once a week, via email. Despite having some health issues, due to the changes in bacteria, food, and altitude (Cusco’s elevation is approx. 11,000 feet), she is always positive and claims she is right where she belongs. She loves her companions- her companion now is from Bolivia and doesn’t speak a lick of English, so they are teaching each other. Her Spanish is coming along well. She struggled with it in the MTC, but now she has a lot of confidence speaking it. The other day we got a reference from a member. The member came with us as we went to the store and talked to them. It was this woman and her mother. We gave the older woman a pamphlet about the Plan of Salvation. Explained what it was, talked about it, and all that. Then we asked her to say the closing prayer and taught her how to pray. I have gotten good at teaching others how to pray. She started to pray and then started crying. She was holding the pamphlet to her as though it was the most precious thing in the world. She came to church with us and I was so happy that the members welcomed her. She was so happy!!! This is why I am here, it’s hard and difficult but so heartwarming and uplifting! I was so busy last week that I didn’t get a chance to sit down and write a post. My mother came up for a visit on Thursday evening and stayed ’til Saturday night. That motivated me to thoroughly clean my house top to bottom before she arrived. I am one who works well under a time crunch. It makes me buckle down and tackle items I’ve been putting off on my to-do list. Besides the general housework that always needs to be done, I cleaned out our kitchen freezer, scrubbed the oven, decluttered our den, cleaned the boys’ laundry room downstairs (which was a tornado of laundry), and took a full load of donations to my church’s thrift store, Deseret Industries (or D.I. for short). 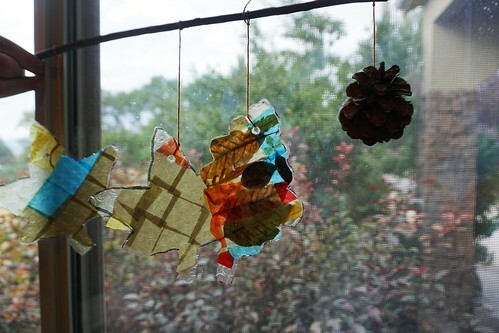 Our September craft for our nature club was a sun-catcher mobile. On top of all that, Marcus and I created and assembled 20 craft kits for our nature club. We had to cut up six colors of tissue paper into 1″ squares, but it was worth it to see happy kids taking home their craft kits and then hear from some of the moms that they were busy making them up that very day. 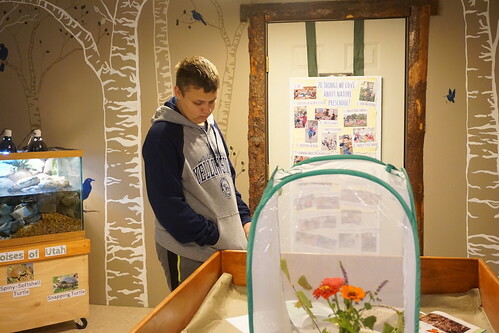 Marcus, observing butterfly chrysalis at the nature center. Saturday was my birthday, which was why my mother was visiting me. We celebrated from Thursday night on, beginning with dinner at Olive Garden with my mother and her husband, who dropped her off. On Friday morning my mother joined Marcus and I at our nature club activity. We have just gotten this club off the ground so I was delighted with the moms who showed up and supported our activity, especially because it was raining. Last week’s activity was rained out in fact, but this time the rain was a light, though steady drizzle and the trail I had chosen was a gravel path so it was not muddy at all. Halfway down the trail is a nature center which meant we spent half of our time indoors. I was pleased with the turnout and everyone seemed to enjoy themselves. 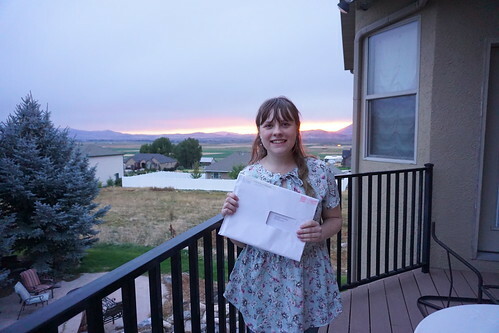 Marissa, holding her unopened mission call. On Saturday after a delicious waffle breakfast, I told Marcus to get our mail. We had forgotten to check the mail on Friday so he came back with a stack of envelopes and two of them were 8 1/2 x 11″ white envelopes. My oldest son, Zach, and I both pounced on Marcus because we knew there was a good chance one of those envelopes was my youngest daughter’s mission call from The Church of Jesus Christ of Latter-day Saints. We were right! There was her mission call. Immediately, Zach and Marcus set out to pick her up from her university apartment and bring her home so she could open it with our family. 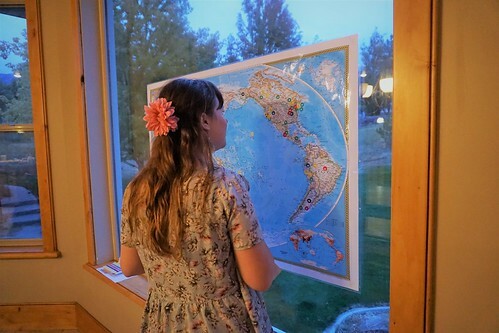 Looking at all the guesses on a world map. A tradition for this time is to contact friends and family and ask for guesses for where the future missionary will serve. It could be practically anywhere in the world as we are a worldwide church. Guesses were coming in by text, Facebook and Instagram, representing several countries and different states in the U.S. It was very exciting and helped to pass the time waiting for Marissa to get home. 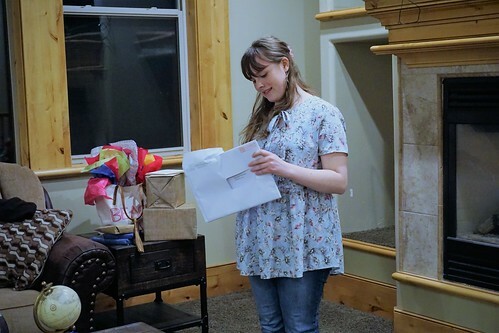 Opening her mission call was a thrilling moment! Once Marissa was home, over four hours later, we had pizza and salad ready for dinner. My mother’s husband had arrived in time to join us. 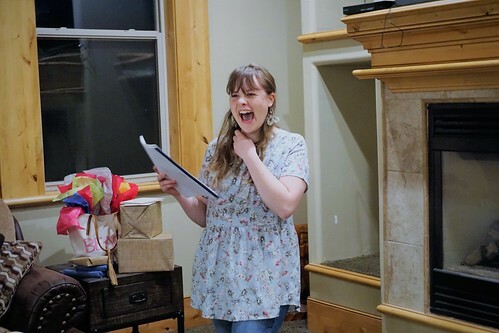 With my husband’s mother on the phone and Zach making a video, Marissa opened her call and read aloud where she has been called to serve an 18-month mission for the Church. I captured her expression of surprise and delight. In January she will report to the Missionary Training Center (MTC) in Lima, Peru. Her mission is the Cusco, Peru mission. 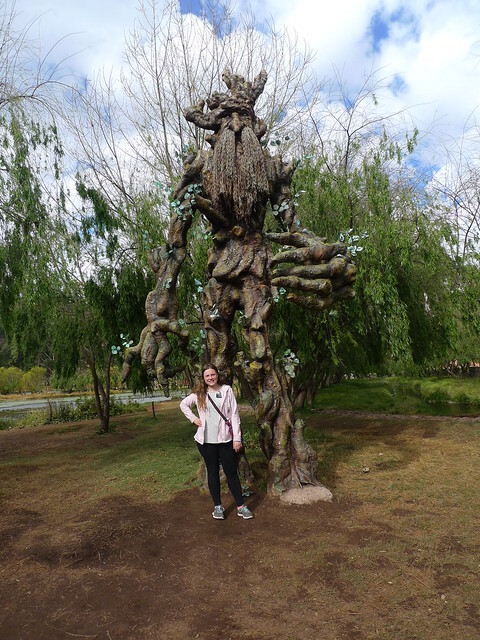 Having lived in Peru, twice, for a total of four years, Marissa is already familiar with the customs and language (Spanish) which she will learn more fluently. We even attended our church meetings in the chapel right next door to the MTC when we last lived there. Since today is Palm Sunday and it’s the start of Holy Week, I want to share a campaign which my church, The Church of Jesus Christ of Latter-day Saints, has launched: The Prince of Peace. I hope you enjoy the video and will take a little time this week to reflect on the eight principles selected from our Savior’s life- Faith, God’s word, Compassion, Gratitude, Prayer, Forgiveness, Repentance, and Hope. Today I’d like to share one of my 52 Stories which focuses on prayer and a recent answer to two prayers. I have been an active member of The Church of Jesus Christ of Latter-day Saints all my life. I honestly cherish my faith because of the gospel of Jesus Christ, which brings me immense joy and peace. I love knowing who I am (a daughter of God), and why I’m here on earth, and how I can return home safely to Him. In my church, each congregation is called a ward and in every ward there are many volunteer opportunities to serve one another. We call these, callings, and we receive our callings from our Heavenly Father through the prayers of inspired ward leaders, such as the presidencies of each organization, and always, the bishopric (the bishop and his first and second counselors). I have held many callings throughout my life, in various wards that I been a part of (in the U.S., Canada, and Peru). I have taught and served children of all ages. I have worked with the youth/teenagers. I have worked with and served the women, or sisters, in my ward. Each calling has taught me different follower and leader skills, and each has stretched me spiritually, growing my testimony. My absolute favorite callings are in Primary, the children’s organization. I love those callings more than any other. I guess you could say, those are my heart callings. My last Primary calling was when I lived in Canada, and it ended in the spring of 2011. For six years now I’ve held callings outside of Primary, which have allowed me to attend Relief Society class on Sundays (Relief Society is the women’s organization). And that has been good for me, but I have truly missed serving in Primary, and for me, it goes a little deeper… I wanted more children, but it wasn’t meant to be, and my kids are now 14, 19, 21 & 24. Sometimes I just miss having little ones in my home. I have been praying often over the past six years for another Primary calling. As some of my readers know, we move around with my husband’s job, but we have a home-base here in Utah. In other words, we have owned a home here in northern Utah for the past five years, but most of that time, we have lived outside of Utah because my husband’s job is not in Utah. This is the first time we have actually lived here consistently as my husband is working from home for the first time ever. So our ward here never knows whether we are coming or going. I’ve been here since last Thanksgiving and in December I started praying to Heavenly Father for any calling in this ward. I remember when I was a Beehive in Young Women’s. My leader was my next door neighbor, Holly. She would let me gab her ear off as she lovingly ironed every article of clothing her family owned. I remember wishing she could be my mother. She was so sweet and fun and she would take the time to listen to me. She had two daughters and I would play with them both even though they were years younger than me. The youngest daughter liked to play house and she always insisted I play the mom. I remember wishing I could play another role because in real life I was a second mom to my younger siblings. I had to be very responsible as the oldest child in my family and so playing house mimicked the things I had to do every day at home. Honestly, I was like a real-life Cinderella, as the household chores and child care always fell to me. To this day I am a very thorough cleaner because it’s so ingrained from the way my mother taught me to clean, but I will not get down on my hands and knees to mop (Thank you Swifter!) as I had to when I was young (and I don’t iron). In Young Women’s there is a value based, goal-setting program called, Personal Progress. I once wrote a little about this on my previous blog (Happy Hearts Homeschool). Well, for my last value project, I took my baby book and each of my four siblings’ baby books and updated them to the current year. My mother had left mine off at 5th grade, which meant each of my siblings was left off at even younger grades. My baby sister’s was barely even started (she is twelve years younger than me). I really tried to make my siblings’ baby books special, adding touches such as stickers and journaling. This was when I discovered my love for scrapbooking and memory books. That is my first memory or story for the 52 Stories project, which I wrote about in my last post. Back to this year’s youth theme, Marcus is my only child left in mutual, but all of my children have fully participated and benefited from Young Men’s and Young Women’s. Having just turned 14, Marcus will be ordained a Teacher this upcoming Sunday at church. He has really enjoyed passing the sacrament as a Deacon these past two years. I have loved watching him solemnly pass the sacrament bread and water in his suit and bow tie (he prefers bow ties to regular ties). He can still continue to pass the sacrament if there are not enough Deacons, but as a Teacher he will now help prepare and clean up the sacrament.